A question came up recently about variations in the age at menarche – the first occurrence of menstruation for a female human – with regards to the environment. A comparison by country seemed like a reasonable first step in noting whether there were in fact any significant, potentially environmental, differences in this age. to review published studies on the variability of age at menarche and age at menopause throughout the world, and to identify the main causes for age variation in the timing of these events. Score! 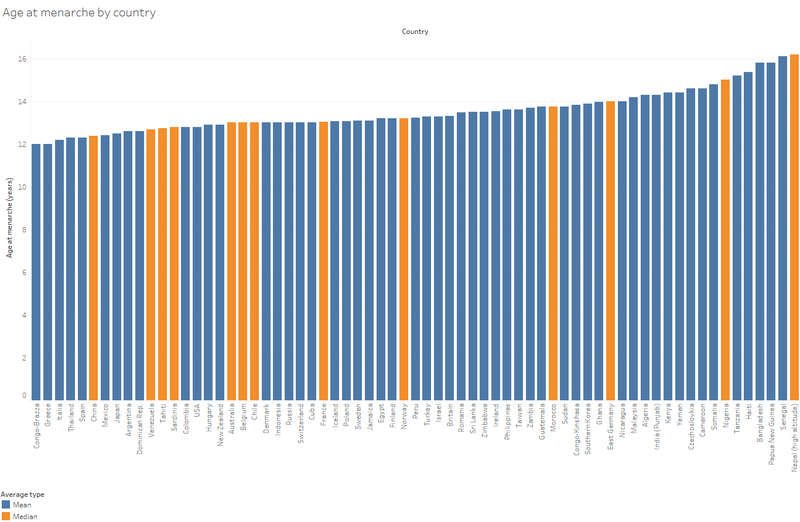 And sure enough, it does contain a lengthyish datatable showing the average age of menarche by country from a survey of prior literature that they did. However, it’s not super easy to get a immediately get a sense of the magnitude of any variation by looking at a datatable from a scanned PDF that was printed over 3 pages. Instead, I decided to extract the data from that table and visualise it in a couple of charts which are shown below, in case anyone else has a similar curiosity about the subject. There’s also an interactive dashboard version available if you click here, where you can filter, highlight, hover and otherwise interact with the data. 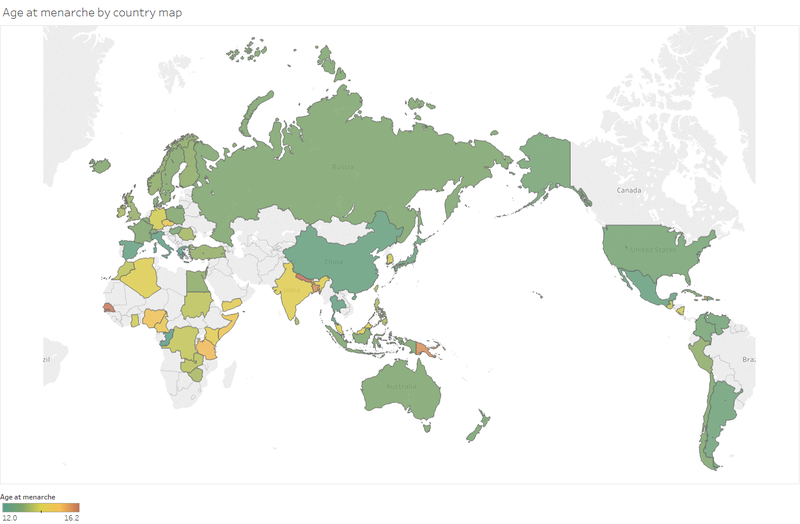 If you have a use for the underlying data yourself, I uploaded it in a machine-readable format to data.world, whereby you can connect directly to it from various analytics tools, use the querying or visualisation tools on the site itself, or download it for your own use. Again, this data is all consolidated by the authors of the Human Biology study above, so full credit is due to them. Firstly, the study I took the data from was published in 2001 i.e. is not particularly recent. The menarche age averages shown were collected from other studies, which obviously took place before 2001 – some even decades before, and in countries that technically no longer exist! They therefore may not reflect current values. It’s generally considered that menarche ages have changed over time to some extent – for example a study concerning self-reported age of menarche in the US “Has age at menarche changed? Results from the National Health and Nutrition Examination Survey (NHANES) 1999-2004.” (McDowell et al, J Adolesc Health. 2007 Mar;40(3):227-31) concluded that “Mean age of menarche declined by .9 year overall in women born before 1920 compared to women born in 1980-84” (and also that ages and changes differed by ethnicity, showing that country averages may mask underlying structural differences). A few other such studies I skimmed, usually focusing on individual countries, also tended to show trends in the same direction. One might hypothesize that countries where the general population has been through even more radical living-condition shifts than residents of the US over the past few decades may have seen larger changes than those reported by McDowell et al. Secondly, some of the averages reported are means, others are medians. These may not be directly comparable. The bar chart I’ve shown above differentiates between those based on the colour of the bar. In the interactive version there’s the ability to filter to only show results based on a single one of those aggregation types. So now onto the interesting theoretical part – OK, menarche age may differ between countries, but why? As noted, that was part of the question driving the authors of the source study, so you should certainly read their whole study to get their take. In summary though, they created a sequence of linear models. The first one shows a negative association between life expectancy and menarche age. OK, but what factors drive life expectancy in the first place, that also correlate with menarche? They produced 2 alternative models to investigate that. The first was a combination of illiteracy rate (with a positive correlation) and vegetable calorie consumption (negative). The second kept illiteracy in, but switched in the country’s average gross national product for vegetable calorie consumption. Vegetable calorie consumption is perhaps somewhat intuitive – it’s been previously found that what their paper describes as “good nutritional conditions” tend to lower the age of menarche, with the body’s fat:mass ratio being potentially involved. There are many papers on that topic – not being remotely a subject matter expert here I’ll pick one at random – “Body weight and the initiation of puberty” (Baker, Clin Obstet Gynecol. 1985 Sep;28(3):573-9. ), which concluded that malnutrition may “retard the onset of menarche”. But the larger influence in the model was the country’s illiteracy rate. Does reading books induce menstruation? Well, hey, probably not directly, so it likely proxies for something that may more plausibly affect menarche. The theory the researchers present here is that societies with higher illiteracy also tend to have a higher incidence of child labour. This labour is often physical in nature, implying a higher rate of energy expenditure. Citing previous evidence that excessive exercise may affect the fat balance, again altering menarche, they form a new hypothesis that it’s in fact the energy balance within a person that may affect menarche. Reading is one of the favoured hobbies in the DabblingWithData household. In 2016 my beloved fiance invited me to participate in the Goodreads Reading Challenge. It’s simple enough – you set a target and then see if you can read that many books. The challenge does have its detractors; you can see that an obsession with it will perversely incentivise reading “Spot the Dog” over “Lord of the Rings“. But if you participate in good spirits, then you end up building a fun log of your reading which, if nothing else, gives you enough data that you’ll remember at least the titles of what you read in years hence. I don’t quite recall where the figure came from, but I had my 2016 challenge set at 50 books. Fifty, you might say, that’s nearly one a week! Surely not possible – or so I thought. I note however that my chief competitor, following a successful year, has set this year’s target to 100, so apparently it’s very possible for some people). Anyway, Goodreads has both a CSV export feature of the books you log as having read in the competition, and also an API. I therefore thought I’d have a little explore of what I managed to read. Who knows, perhaps it’ll help improve my 2017 score! Please click through for slightly more interactive versions of any chart, or follow this link directly. Most data is taken directly from Goodreads, with a little editing by hand. Oh no, I missed my target 😦 Yes, fifty books proved too challenging for me in 2016 – although I got 80% of the way there, which I don’t think is too terrible. My 2017 target remains at fifty. The cumulative chart shows a nice boost towards the end of August, which was summer holiday time for me. This has led me to conclude the following actionable step: have more holidays. I was happy to see that I hadn’t subconsciously tried to cheat too much by reading only short books. From the nearly 14k page-equivalents I ploughed through, the single most voluminous book was Anathem. Anathem is a mix of sci-fi and philosophy, full of slightly made-up words just to slow you down further – an actual human:alien glossary is generously included in the back of the book. The shortest was the Ladybird Book of the Meeting. This was essential reading for work purposes of course, and re-taught me eternal truths such as “Meetings are important because they give everyone a chance to talk about work. Which is easier than doing it”. Most of my books were in the 2-400 page range – although of course different books make very different usages of a “page”. So what did I read about? Science fiction is #1 by book volume. I have an affinity for most things that have been deemed geeky through history (and perhaps you do too, if you got this far in! ), so this isn’t all that surprising. Philosophy at #2 is a relatively new habit, at least as a concerted effort. I felt that I’d got into the habit of concentrating too much on data (heresy I know), technology and related subjects in previous years’ reading habits – so thought I’d broaden my horizons a bit by looking into, well, what Google tells me is merely the study of “the fundamental nature of knowledge, reality, and existence”. It’s very interesting, I promise. Although it can be pretty slow to read as every other sentence one does risk ending up staring at the ceiling wondering whether the universe exists, and other such critical issues. Joking aside, the study of epistemology, reality and so on might not be a bad idea for analysty types. Lower down we’ve got the cheap thriller and detective novels that are somewhat more relaxing, not requiring either a glossary or a headache tablet. I was a little surprised at what a low proportion of my books were read in eBook format. For most – not all – books, I think eReaders give a much superior reading experience to ye olde paper. This I’m aware is a controversial minority opinion but I’ll stick to it and point you towards a recent rant on the Hello Internet podcast to explain why. So I’d have guessed a 80-90% eBook rate – but a fair number of paper books actually slipped in. Typically I suspect these are ones I borrowed, or ones that aren’t available in eBook formats. Some of Asimov’s books, of which I read a few this year, for instance are usually not available on Kindle. On which subject, authors. Most included authors only fed my book habit once last year, although the afore-mentioned Asimov got his hooks into me. This was somewhat aided by the discovery of a cluster of his less well-known books fortuitously being available for 50p each at a charity sale. But if any readers are interested in predictive analytics and haven’t read the Foundation Trilogy, I’d fully recommend even a full price copy for an insight into what the world might have to cope with if your confusion matrix ever showed perfection in all domains. Sam Harris was the second most read. That fits in with the philosophy theme. He’s also one of the rare people who can at times express opinions that intuitively I do not agree with at all, but does it in a way such that the train of thought that led him to his conclusions is apparent and often quite reasonable. He is, I’m aware, a controversial character on most sides of any political spectrum for one reason or another. Back to format – I started dabbling with audio books, although at first did not get on so well with them; there’s a certain amount of concentration needed which comes easier to me when visual-reading than audio-reading. But I’m trying again this year, and it’s going better – practice makes perfect? The “eBook /Audio” category refers to a couple of lecture series from the Great Courses which give you a set of half hour lectures to listen to, and an accompanying book to follow along with. These are not free but they cover a much wider range of topics than the average online MOOC seems to (plus you don’t feel bad about not doing assignments – there are none). Lastly, the GoodReads rating. Do I read books that other people think are great choices? Well, without knowing the background distribution of ratings, and taking into account the number of reviews and from whom, it’s hard to do much except assume a relative ranking when the sample gets large enough. It does look like my books are on the positive side of the 5-points scale, although definitely not the amongst GoodReads’ most popular. Right now, that list starts with The Hunger Games, which I have read and enjoyed, but it wasn’t in 2016. Looking down the global popularity list, I do see quite a few I’ve had a go at in the past, but almost none that I regret choosing one of my actual choices over this year at first sight! For the really interested readers out there, you can see the full list of my books and links to the relevant Goodreads pages on the last tab of the viz. For a while, a couple of key members of the insatiably effervescent Tableau community, Andy Cotgreave and Andy Kriebel, have been running a “Makeover Monday” activity. Read more and get involved here – but a simplistic summary would be that they distribute a nicely processed dataset on a topic of the day that relates to someone else’s existing visualisation, and all the rest of us Tableau fans can have a go at making our own chart, dashboard or similar to share back with the community so we can inspire and learn from each other. It’s a great idea, and generates a whole bunch of interesting entries each week. But Andy K noticed that each Monday’s dataset was getting way more downloads than the number of charts later uploaded, and opened a discussion as to why. There are of course many possible reasons, but one that came through strongly was that, whilst they were interested in the principle, people didn’t think they had the time to produce something comparable to some of the masterpieces that frequent the submissions. That’s a sentiment I wholeheartedly agree with, and, in retrospect – albeit subconsciously – why I never gave it a go myself. Chris Love, someone who likely interacts with far more Tableau users than most of us do, makes the same point in his post on the benefits of Keeping It Simple Stupid. I believe it was written before the current MakeoverMonday discussions began in earnest, but was certainly very prescient in its applications to this question. Despite this awesome community many new users I speak to are often put off sharing their work because of the high level of vizzes out there. They worry their work simply isn’t up to scratch because it doesn’t offer the same level of complexity. To be clear, the original Makeover Monday guidelines did include the guideline that it was quite proper to just spend an hour fiddling around with it. But firstly, after a hard day battling against the dark forces of poor data quality and data-free decisions at work, it can be a struggle to keep on trucking for another hour, however fun it would be in other contexts. And that’s if you can persuade your family that they should let you keep tapping away for another hour doing what, from the outside, looks kind of like you forgot to finish work. In fact a lot of the worship I have for the zens is how they fit what they do into their lives. But, beyond that, an hour is not going to be enough to “compete” with the best of what you see other people doing in terms of presentation quality. I like to think I’m quite adept with Tableau (hey, I have a qualification and everything :-)), but I doubt I could create and validate something like this beauty using an unfamiliar dataset on an unfamiliar topic in under an hour. It’s beautiful; the authors of this and many other Monday Makeovers clearly have an immense amount of skill and vision. It is fascinating to see both the design ideas and technical implementation required to coerce Tableau into doing certain non-native things. I love seeing this stuff, and very much hope it continues. But if one is not prepared to commit the sort of time needed to do that regularly to this activity, then one has to try and get over the psychological difficulty of sharing a piece of work which one perceives is likely to be thought of as “worse” than what’s already there. This is through no fault of the MakeoverMonday chiefs, who make it very clear that producing a NYT infographic each week is not the aim here – but I certainly see why it’s a deterrent from more of the data-downloaders uploading their work. And it’s great to see that topic being directly addressed. After all, for those of us who use Tableau for the day-to-day joys of business, we probably don’t rush off and produce something like this wonderful piece every time some product owner comes along to ask us an “urgent” question. Instead, we spend a few minutes making a line chart, that gives them some insight into the answer to their question. We upload an interactive bar chart, with default Tableau colours and fonts, to let them explore a bit deeper and so on. We sit in a meeting and dynamically provide an answer to enable live decision-making that before we had tools like this would have had to wait a couple of weeks to get a csv report on. Real value is generated, and people are sometimes even impressed, despite the fact that we didn’t include hand-drawn iconography, gradient-filled with the company colours. Yes, it’s “simple”, it’s unlikely to go Tableau-viral, but it makes a key story held within that data very clear to see. And its far more typical of the day-to-day Tableau use I see in the workplace. For the average business question, we probably do not spend a few hours researching and designing a beautiful colour scheme in order to perform the underlying maths needed to make a dashboard combining a hexmap, a Sankey chart and a network graph in a tool that is not primarily designed to do any of those things directly. No-one doubts that you can cajole Tableau into such artistry, and there is sometimes real value obtainable by doing so, or that those who carry it out may be creative geniuses -but unless they have a day job that is very different than that of mine and my colleagues, then I suspect it’s not their day-to-day either. It’s probably more an expression of their talent and passion for the Tableau product. Pragmatically, if I need to make, for instance, a quick network chart for “business”, then, all other things being equal, I’m afraid I’m more likely I get out a tool that’s designed to do that rather than take a bit more time to work out how to implement it in Tableau, no matter how much I love it (by the way, Gephi is my tool of choice for that – it is nowhere near as user friendly as Tableau, but it is specifically designed for that sort of graph visualisation; also recent versions of Alteryx can do the basics). Honestly, it’s rare for me that these more unusual charts need to be part of a standard dashboard; our organisation is simply not at a level of viz-maturity where these diagrams are the most useful for most people in the intended audience, if indeed they are for many organisations. And if you’re a professional whose job is creating awesome newspaper style infographics, then I suspect that you’re not using Tableau as the tool that provides the final output either, more often than not. That’s not its key strength in my view; that’s not how they sell it – although they are justly proud of the design-thought that does go into the software in general. But if paper-WSJ is your target audience, you might be better of using a more custom design-focused tool, like Adobe Illustrator (and Coursera will teach you that specific use-case, if you’re interested). I hope nothing here will cause offence. I do understand the excitement and admire anyone’s efforts to push the boundaries of the tool – I have done so myself, spending way more time than is strictly speaking necessary in terms of a theoretical metric of “insights generated per hour” to make something that looks cool, whether in or out of work. For a certain kind of person it’s fun, it is a nice challenge, it’s a change from a blue line on top of an orange line, and sometimes it might even produce a revelation that really does change the world in some way. This work surely needs to be done; adherents to (a bastardised version of) Thomas Kuhn’s theory of scientific revolutions might even claim this “pushing to the limits” as one of the ways of engendering the mini-crisis necessary to drive forward real progress in the field. I’m sure some of the valuable Tableau “ideas“, that feed the development of the software in part, have come from people pushing the envelope, finding value, and realising there should be an easier way to generate it. There’s also the issue of engagement: depending on your aim, optimising your work for being shared worldwide may be more important to you than optimising it for efficiency, or even clarity and accuracy. This may sound like heresy, and it may even touch on ethical issues, but I suspect a survey of the most well-known visualisations outside of the data community would reveal a discontinuity with the ideals of Stephen Few et al! But it may also be intimidating to the weary data voyager when deciding whether to participate in these sort of Tableau community activities if it seems like everyone else produces Da Vinci masterpieces on demand. Now, I can’t prove this with data right now, sorry, but I just think it cannot be the case. You may see a lot of fancy and amazing things on the internet – but that’s the nature of how stuff gets shared around; it’s a key component of virality. If you create a default line chart, it may actually be the best answer to a given question, but outside a small community who is actively interested in the subject domain at hand, it’s not necessarily going to get much notice. I mean, you could probably find someone who made a Very Good Decision based even on those ghastly Excel 2003 default charts with the horrendous grey background if you try hard enough. Tableau is sold with emphasis on its speed of data sense-marking, claiming to enable producing something reasonably intelligible 10-100x faster than other tools. If we buy into that hype, then spending 10 minutes of Tableau time (necessitating making 1 less cup of tea perhaps) should enable me to produce something that it could have taken up to 17 hours to produce in Excel. OK, that might be pushing the marketing rather too literally, but the point is hopefully clear. For #MakeoverMonday, some people may concentrate on how far can they push Tableau outside of its comfort zone, others may focus on how they can integrate the latest best practice in visual design, whereas here I will concentrate on whether I can make anything intelligible in the time that it takes to wait for a coffee in Starbucks (on a bad day) – the “10 minute” viz. In the past few weeks, I was appalled to read that an UK resident was given a prison sentence for the supposed “crime” of having an abortion. This happened because she lives in Northern Ireland, a country where having an abortion is in theory punishable by a life sentence in jail – unless the person in need happens to be rich enough to arrange an overseas appointment for the procedure, in which case it’s OK. Abortion rights have been a hugely contentious issue over time, but for those of us who reside in a wealthy country with relatively progressive laws on the matter, and the medical resources needed to perform such procedures efficiently, it’s not always easy to remember what the less fortunate may face in other jurisdictions. In 2016, can it really still be the case that any substantial number of women face legal or logistic issues in their right to choose what happens to their body, under conditions where the huge scientific consensus is against the prospect of any other being suffering? How often do abortions occur – over time, or in different parts of the world? Is there a connection between more liberal laws and abortion rates? And what are the downsides of illiberal, or medically challenged, environments? These, and more, are questions I had that data analysis surely could have a part in answering. I found useful data in two key places; a 2012 paper published in the Lancet, titled “Induced abortion: incidence and trends worldwide from 1995 to 2008” and from various World Health Organisation publications on the subject. It should be noted that abortion incidence data is notoriously hard to gather accurately. Obviously, medical records are not sufficient given the existence of illegal or self-administered procedures noted above. It is also not the case that every women has been interviewed about this subject. Worse yet, even where they have been, abortion remains a topic that’s subject to discomfort, prejudice, fear, exclusion, secrecy or even punishment. This occurs in some situations more than others, but the net effect is that it’s the sort of question where straightforward, honest responses to basic survey questions cannot always be expected. I would suggest to read the 2012 paper above and its appendices to understand more about how the figures I used were modelled by the researchers who obtained them. But the results they show have been peer reviewed, and show enough variance that I believe they tell a useful, indeed vital, story about the unnecessary suffering of women. It’s time to look into the data. Please click through below and explore the story points to investigate those questions and more. And once you’ve done that -or if you don’t have the inclination to do so – I have some more thoughts to share below. Thanks for persisting. No need to read further if you were just interested in the data or what you can do with it in Tableau. What follows is simply commentary. This blog is ostensibly about “data”, the use of which some attribute notions of cold objectiveness to; a Spock-like detachment coming from seeing an abstract number versus understanding events in the real world. But, in my view, most good uses of data necessarily result in the emergence of a narrative; this is a (the?) key skill of a data analyst. The stories data tells may raise emotions, positive or negative. And seeing this data did so in me. For those that didn’t decide to click through, here is a brief summary of what I saw. It’s largely based on data about the global abortion rate, most often defined here as the number of abortions divided by the number of women aged 15-44. Much of the data is based on 2008. For further source details, please see the visualisation and its sources (primarily this one). The abortion rate in 2008 is pretty similar to that in 2003, which followed a significant drop from 1995. Globally it’s around 28 abortions per 1,000 women aged 15-44. This equates to nearly 44 million abortions per year. This is a process that affects very many women who go through it, affecting also the network of people that love, care for or simply know them. a procedure for terminating an unintended pregnancy either by individuals without the necessary skills or in an environment that does not conform to minimum medical standards, or both. In reality, this translates to a large variety of sometimes disturbing methods, from ingestion of toxic substances, inappropriate use of medicines, physical trauma to the uterus (the use of a coathanger is the archetypal image for this, so much so that protesters against the criminalisation of abortion have used them as symbols) – or less focussed physical damage; such as throwing oneself down stairs, or off roofs. Appallingly, the proportion of abortions that were unsafe in 2008 has gone up from previous years. Any medical procedure is rarely 100% safe, but a safe, legal, medically controlled abortion contains a pretty negligible chance of death. Unsafe abortions are hundreds of times more likely to be fatal to the recipient. And for those that aren’t, literally millions of people suffer consequences so severe they have to seek hospital treatment afterwards – and these are the “lucky” ones for whom hospital treatment is even available. This is to say nothing of the damaging psychological effects. Therefore, societies that enforce or encourage unsafe abortions should do so in the knowledge that their position is killing women. Some may argue that abortion, which few people of any persuasion could think of as a happy or desirable occurrence, is encouraged where it is freely legally available. They are wrong. There is no suggestion in this data that stricter anti-abortion laws decrease the incidence of abortions. In fact, if anything, in this data the association runs the other way. Geopolitical regions with a higher proportion of people living in areas where abortions are illegal actually, on the whole, see a higher rate of abortion. I am not suggesting here that more restrictive laws cause more abortions directly, but it is clearly not the case that making abortion illegal necessarily makes it happen less frequently. But stricter laws do, more straightforwardly, lead to a higher proportion of the abortions that take place anyway being unsafe. And thus, on average, to more women dying. Abortion is a contentious issue and it will no doubt remain so, perhaps mostly for historic, religious or misogynistic reasons. There are nonetheless valid physical and psychological reasons why abortion is, and should be, controlled to some extent. No mainstream view thinks that one should treat the topic lightly or wants to see the procedure becoming a routine event. As the BBC notes, even ardent “pro-choice” activists generally see it as the least bad of a set of bad courses of action available in a situation that noone wanted to occur in the first place, and surely no-one that goes through it is happy it happened. But it does happen, it will happen, and we know how to save thousands of lives. Seeing this data may well not change your mind if you’re someone who campaigns against legal abortion. It’s hard to shift a world-view that dramatically, especially where so-called moral arguments may be involved. But – to paraphrase the Vizioneer, paraphrasing William Wilberforce, with his superb writeup after visualising essential data on the atrocities of modern-day human trafficking – once you see the data then you can no longer say you do not know. The criminalisation-of-abortion lobby are often termed “pro-lifers”. To me, it now seems that that nomenclature has been seized in a twisted, inappropriate way. Once you know that the policies you campaign for will unquestionably lead to the harming and death of real, conscious, living people – then you no longer have the right to label yourself pro-life.